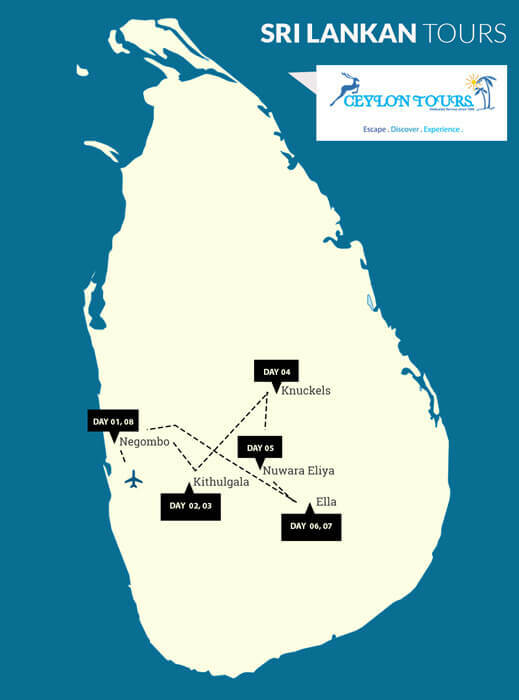 On arrival to Sri Lanka you will be met and assisted by our Airport Representative, who will direct you to your very own chauffeur, to initiate the transfer to the quaint village of Negombo. If you have spare time, your chauffeur will introduce you to some of Negombo’s curious sites such as the Dutch churches, perhaps take a boat ride along the Dutch canals or enjoy the beach. Feasting on a wonderful breakfast spread we’ll be leaving for Kithulgala – a quaint small town perched on the hills that slope down to the flowing waters of the Kelani River. The main attractions include white water rafting, trekking and the Kelani Forest Reserve, which is a popular bird watching location. Overnight Stay : Camping in Kithulgala. After breakfast at your campsite make your way to the Kelani River and enjoy a thrilling day of white water rafting, and water fall abseiling. Rise early morning and leave for Knuckles Forest Range with a packed breakfast. This mountain range offers a wonderful place for Bird watching, Trekking, Wildlife Photography, and Camping. It also holds great fascination for geologists and naturalists. Overnight Stay : Camping in Knuckles. Continue on to Ella a little village surrounded by high mountains and breathtaking vistas in the central hills of the country. It is famous for the Ella Gap – a gap in the mountains where you can see all the way up to the ocean. It is also a base for plenty of trekking expeditions to the surrounding countryside and offers many beautiful scenery and waterfalls. Overnight Stay : Ella Adventure site. After breakfast enjoy a full day of adventure activities. Many adventure activities can be indulged in at the site such as Aerial Rope, Monkey rope, Slithering rope, Toddy tapping, Mud activities, Para Gliding, Paint ball, Water polo, Canoeing, Kayaking and Mountain biking etc..
After breakfast, continue on a day full of activity and adventure. After breakfast leave for the fishing village of Negombo and enjoy the rest of the day at leisure. Now that you are at the end of your journey with us, after breakfast your chauffeur will take you to the international airport in time for your departure flight.